Rice Pancake is pancake made with rice. It is known as Sinasir in Northern Nigeria. It is prepared with the soft variety of rice, the type used for Tuwo Shinkafa. Soak the soft rice with warm water over night or for at least 8 hours. Boil some rice that will be equivalent to cup boiled rice. I normally use left over boiled white rice for this. Add all the ingredients: the soaked rice, cooked rice, diced onions, salt, sugar, yeast, egg and Peak Milk into a blender. Add just enough water to help the blades of your blender move. Cover the bowl, leave it in a warm place for about 30 minutes. Pour a small amount of vegetable oil into the pan. Once hot, pour some batter into the pan making sure it is as thin as possible. Fry on medium heat till the top cakes and the underside is golden. Flip to fry the other side till light brown. Watch the video below for visual details. 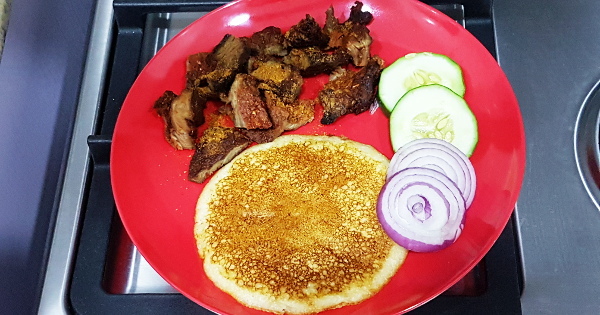 Serve with Suya Pepper (Yaji), Nigerian Suya, Onions, Pepper Soup or eat as a snack with a chilled drink.